I was patiently waiting for him at the airport bus drop off, near the station named Nordfriedhof (North Cemetery). Holding tight my little piece of cardboard written “Vince of wood” on it. My friend Vincent was coming to visit me in Munich. Over 6,000 kilometres away from home and ten months after leaving. I was ecstatic. We set him up a nice itinerary. It would start with him solo flying to Rome for a few days of soulsearching, or more like seeing a city he described as “Cool ruins“, “smelling a bit like pee in a few too many places” and to flirt with a Welsh barmaid he met at an Irish pub. Which he told me about a few times already. Then we were to meet two other friends in Prague. They were to land in Luxembourg on the 6th of May and get to Prague quickly so we could have a few days in the Czech capital. He got off the bus, a smile on his face, we hugged, made jokes about his time in Rome and his first time flying. The next day, we were en route to Prague. Tell me, what do a Czech girl, a Belgian photographer, a baby with a plastic cellphone, two Canadians and a mysterious Russian sounding chap have in common ? They were stuck in a busted old natural gas operated Opel minivan on their way to Prague of course. . . (Turns out the mysterious chap was in fact Polish, and the silent type). The first challenge once we arrived was to get some of the local currency, despite our total lack of Czech magical words like “please”, “thanks” and “how the hell does this ticket machine work“. We eventually managed to locate an ATM and get some Czech crowns. Our surprise when the ATM suggested 2,000, 5,000 and 20,000 operations. Well 80€ were about 2,000 crowns. Next step was to walk around and kill time until 22:00, when we would have to head to our Couchsurfing hosts; Renata and Mirek. After walking around, we hit our first pub, a lovely place where we had our first taste of Czech food and beer, and chatted up a fellow traveller, a lovely girl from Australia sitting right next to us. Shortly after getting in touch with the culture (beer and meals involving a ton of sauce and bread) we met with our lovely hosts in their beautiful neighbourhood in Prague 5 district, we went to bed and prepared for our adventuring of the next day. We kicked off the new day by going through a small park and try to locate a small restaurant & beer garden Renata mentioned that was really close to her house and then headed straight for the Petrin Hill observation tower. Quickly the light started to fade out and we knew we had to hurry up and head to the bridge if we wanted to capture some interesting colours. The cobble stone paved bridge was filled with tourists admiring the beautiful city and it’s architecture. Fixed emotions carved in stone adorned some sides of the famous bridge, my hunt for a beautiful moment etched on an SD card started. A bit later we got on our way to one last pub and arrived home. Just in time for our host’s birthday party. 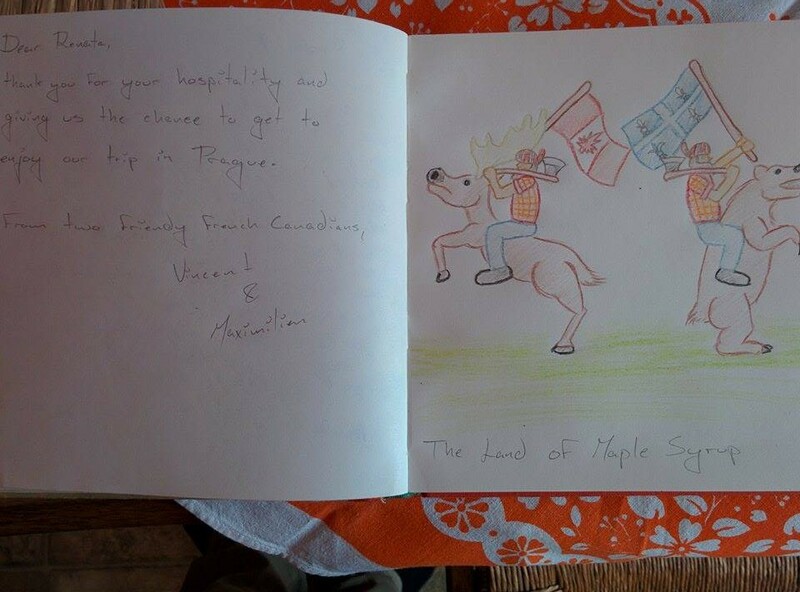 We met some interesting people, and they had Vincent draw in their guest book. 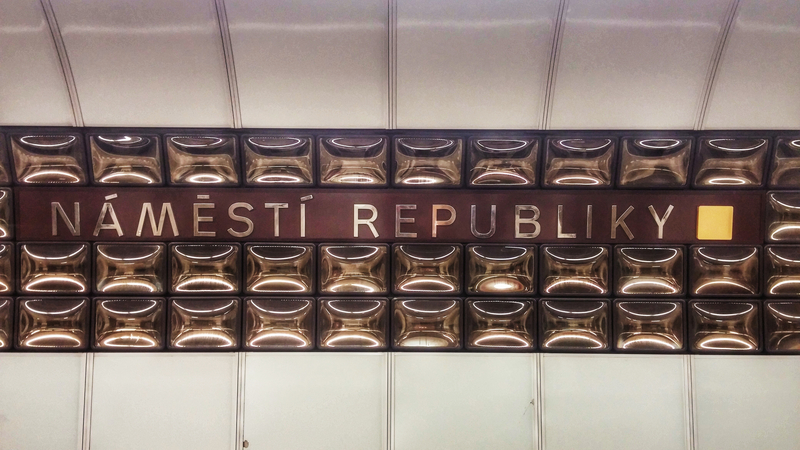 In two days we zipped through the city, Couchsurfed with people of a completely different culture, enjoyed some delicious and extremely cheap beer, noticed that the people of Prague are beautiful above normal and most importantly, we both spent time with a friend we hadn’t seen in forever. The next morning we were gone, on our way back to München. . .